Take time to get away. O Lordy - ZERO CLOSETS! 100 feet from ocean rocks. 5 minutes from Pebble Beach. 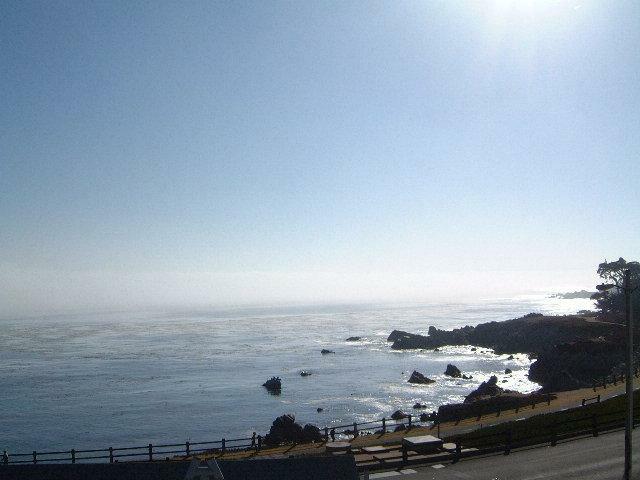 that looks out upon the otters and dolphins of Monterey Bay. The path adjacent to Lover's Point. Just a few yards from this Victorian home, high above the bay. Come feel safely cradled in the bosom of Lovely Mother Earth. before you rise bright to slice tasty green divots from her shore. 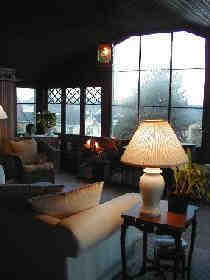 Living room with large picture windows facing "north"
Living room facing "east", with loveseat in hexagon shaped alcove. 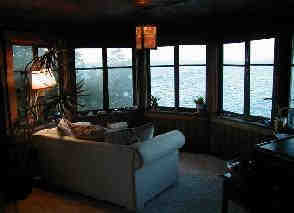 Fantastic views of Monterey Bay from these windows. directly on the water, as well. Allow time for a nice long soak in the old fashioned claw-foot bathtub. I'll provide the bubbles. It is also my pleasure to treat you to morning coffee, tea, juice, fruit and muffins. Downtown is only a couple of minutes away on foot. 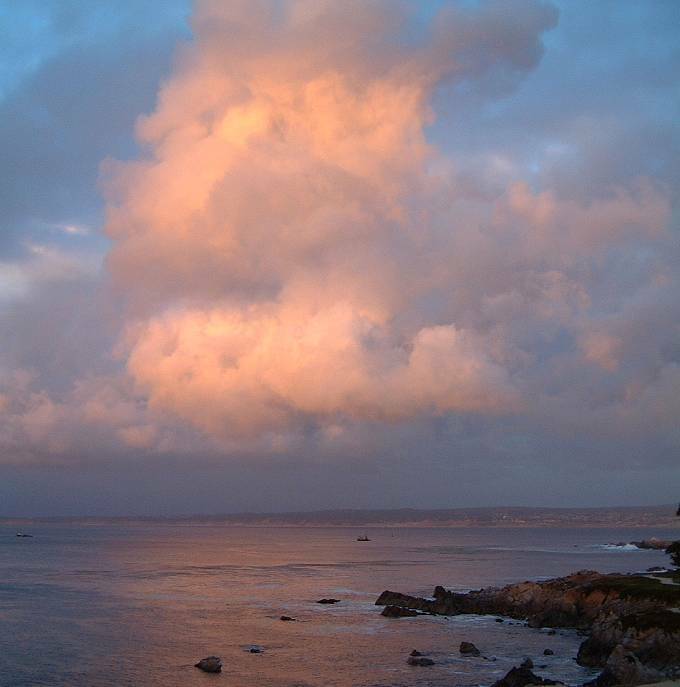 Stroll around Pacific Grove and discover its treasures, including many fine restaurants, a local art center, library, museum of natural history, antique shops and some great little coffee shops. 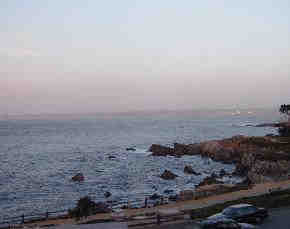 The Monterey Bay Aquarium is within walking distance along the hiking/biking path. 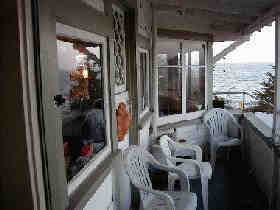 Although there are cars passing below on Ocean View Boulevard, my cozy little aerie is set far back and high above. It sits behind two homes that face the road directly, so any traffic noise is minimal. (I took this photo at dusk from my balcony). 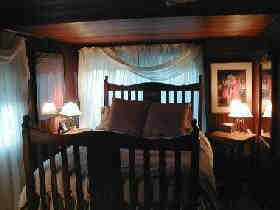 covers walls and ceiling, wraps you in a cocoon that feels remarkably like a sailing ship's cabin. 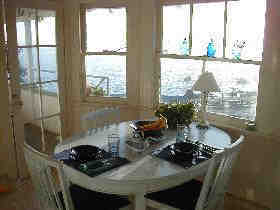 Sweeping views of the bay can be seen from almost every window (and there are lots of them). 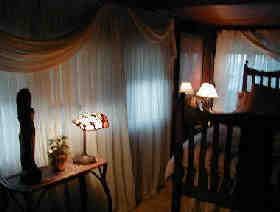 Since it occupies the top floor of a one hundred year old Victorian, the ceiling has interesting angles, and pitches. Redwood strip panelling adds warmth to the interior. They don't make them like this anymore. and California at large. But only good words for the IDEA of this Golf Love Nest! BESIDES THIS TESTIMONIAL, I REMAIN FACTUALLY IGNORANT. I never set foot in the rest of this 1903 house. Been almost two years since then. I think this "loft" is now occupied by an offspring of the Owners (downstairs?). Living? Dead? Burned down? Who knows? Ask, and I shall make inquiries. 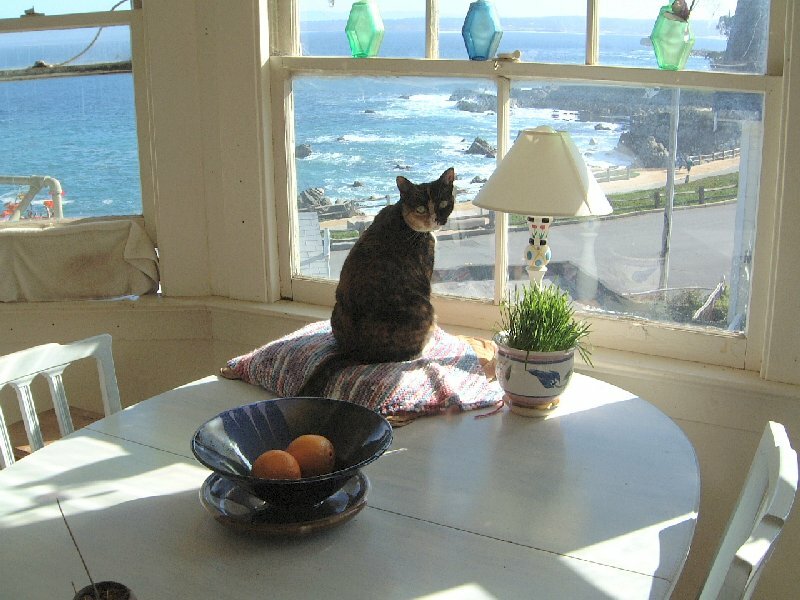 The History of Pacific Grove--"The Last Hometown"
Hey Catherine - The Pebble Beach SPA!